Abstract: Although there is still a great deal of work to be done to perfect the performance of flat panel display technology, a display with highly realistic interaction, a display content can “float” in space instead of at the panel surface, will lead the new revolution. Micro-LEDs are a technology that can very likely achieve this goal. The very-high-density light rays that can be generated by micro-LEDs arrays may become a key enabler for light-field displays – an exciting technology that can produce true 3D display images in real time. The presentation will give overview of MicroLED technology as well as application challenge of the technology. Bio: He has established well-known reputation as a leading expert in display industry, especially in the field of emissive display. He has tracking record of making initial technology innovation into manufacturing technology and creating consumer electronic products successfully in high yield mass production. In his 20 years display career he developed many new materials, production processes technology, device structures, driving waveforms and measurement methods for display products. He has over 35 journal publications, 26 conference presentations, and 15 display technology related patents in his professional career. Due to his outstanding contributions to display technology, he won SID (Society for Information Display) Special Recognition Award in 2013 and SID Fellow Award in 2017. He is currently the director of SID Beijing Chapter and the general manager of SID China, the only SID operational entity outside USA. He is the Chair of Display Technology Training School Committee at SID. The MircoLED was introduced to SID emissive display subcommittee by him when he was the chair of emissive display subcommittee from 2014-2017. 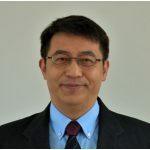 He holds a few joint Professorship at Fudan University, Xian Jiaotong University, Southeastern University, and University of Electronic Science and Technology of China, and a full professor at Fuzhou University at Fujian province in China. He was the chief scientist for Changhong Electric Group, one of the largest consumer electronics conglomerate in China. He has led the team successfully developed high luminous efficiency technology, greatly reduced the power consumption of plasma TV over 50%, achieved the best luminous efficacy PDP in the world. Prior to his job at Changhong, he was the chief research scientist at Panasonic Plasma Display Laboratory of America Inc. (formerly Plasmaco, 1997-2008). He led the effort of the development of new material, new device structure, and new driving waveform for next generation plasma display panel (PDP) and improving process for panel production. Before his industry job, he was a research scientist at Oak Ridge National Laboratory at Oak Ridge, Tennessee between 1995 and 1997. He holds Ph.D. in physics from Vanderbilt University at Nashville, Tennessee and M.S. and B. S. in physics from Fudan University, in China.